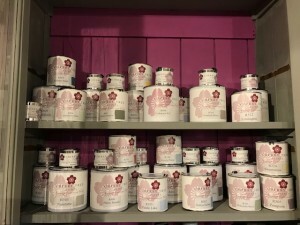 Shabby Barn is an official stockist for Autentico Chalk Paint, a Dutch based company distributed in the UK and Cherry Tree Paints made and distributed in Devon. Both quality products, easy to use and offering a fantastic colour pallet and finishes. 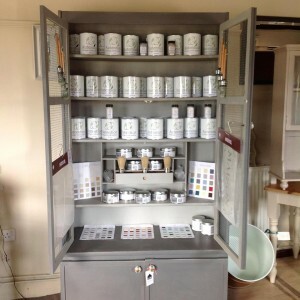 We hold comprehensive stocks, including chalk, superior eggshell, emulsions, a durable outdoor finish and a full range of coloured and speciality waxes & paints. Anything we don’t have we can order for you. As well as paint we offer a comprehensive selection of brushes for every purpose, paint effects like crackle glaze, stensils and sample pots. In fact everything you need to start your painting project. Help and assistance is always at hand with advice on colours and finishes. We also hold painting workshops each month (see our separate page) so why not sign up for a place at one of these; they are great fun and practically based to give you the skills you need for a really quality finish. All your painting requirements can be found at Shabby Barn, plus a view to remember! Shabby Barn, established in May 2012, is the creation of Louise Goodall and her mother and partner Jane Livesey who along with their family run the business from their home at Birch Farm. Sourcing most of their stock from France, Louise and Jane are always on the look-out for the unusual. Undertaking all the refurbishment themselves, they work their magic on all types of furniture, both old and new.